In my humble opinion, the two greatest things about living in San Diego are the beaches and the beer. So, what could be better than combining the two? Here’s a list of breweries and brewpubs that offer the best combinations of brews with views. I’ve organized them from north to south – basically along the coast – from Oceanside all the way down to Coronado Island. Situated on the Coast Highway, Breakwater is only a block up from the beach. The brewpub has embraced the casual surfer vibe of the area, and even serves their tasting flights on little wooden surfboards. A perfect spot to relax after a day at the beach, Breakwater has a full menu and an impressive variety of taps that feature their own house brews (about 14) as well as guest beers (about 24). Be sure to also grab a taste of their Rabiscus Mead, which is a fairly unique offering. Another casual, family friendly brewpub that’s only a few blocks or so from the water, Pizza Port has been a top local favorite for many years. Awesome pizzas and salads accompany some of San Diego’s most award-winning beers, all available from a large selection of taps (Sharkbite red and Swamis IPA are two crowd faves). Interesting guests beers are another regular feature of Pizza Port, as is the loud, fun, boisterous atmosphere that makes it a perfect after-beach chill for parents and kids alike. The Pizza Port in Solana Beach, like its siblings in Carlsbad and Ocean Beach, is also just a shell’s-throw from the water. And like all Pizza Ports, the beach-inspired setting is all about good food, great beer, and relaxing in a casual, friendly spot. Each Pizza Port shares certain beers with all the others, but each location also has its own brewer, so don’t miss the excellent offerings that are unique to each location. Culture Brewing is just a block or two from Pizza Port and two blocks from the beach. As one of the “new kids,” this small tasting room and brewery has faced the challenge of offering their beers in the shadow of Pizza Port, which has been a Solana beer mecca for a long time. The talented folks at Culture, however, seem up to the task (try the black IPA if you can). > Find out more about Culture Brewing Co. Here are two great ocean-centric locations, each right off the beach with great views. The family friendly PB Ale House offers a full menu as well as 8 or 9 house beers, all served up in a large space that offers everything from outdoor seating, to indoor tables, to an awesome rooftop area, which is the place to go for the most impressive view. 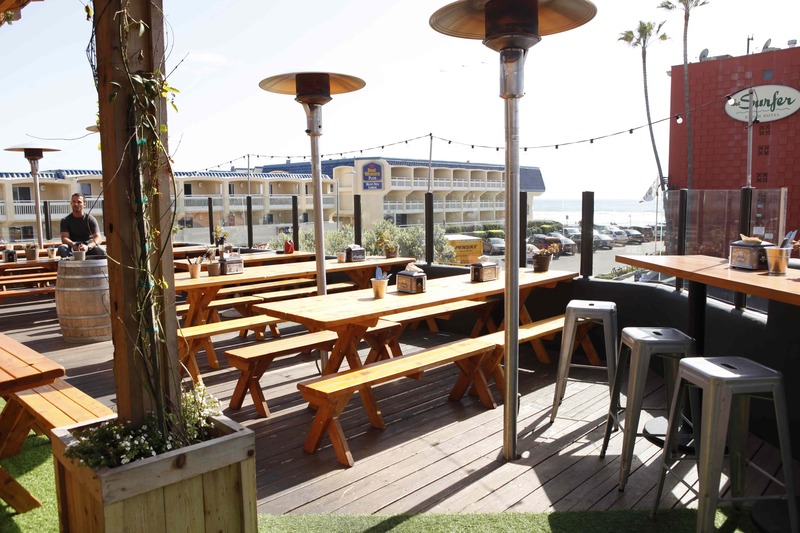 Just a few blocks south of PB Ale House is Amplified Ale Works, which also boasts a good view of the water, a full menu (it’s part of California Kabob House), and nice outdoor seating bathed by fresh ocean breezes. Though their list of house brews is relatively short, they are all long on flavor (Belgian fans should not miss the Bier de Garde). In the spring of 2013, Coronado completed this wonderful new facility just a quarter-mile or so from Mission Bay. A huge brewery fills most of the space, but there’s plenty of room for thirsty patrons in the large tasting area. Given its proximity to the bay, this Coronado location provides the perfect capper to a busy day of water sports, beachcombing, or exploring the many wonders of SeaWorld. After all that activity, few things will taste as good as a cold Orange Ave. Wit, a Mermaid’s Red, or the Frog’s Breath IPA. Here’s another great Pizza Port location, a block or so in from the water, and filled with great beer, delicious pizza, and a warm, friendly, SoCal vibe. On the small side, compared to its Carlsbad siblings, this location still provides a great lineup of house-made beers, as well as Pizza Port core production beers, and guest beers. There’s no better vantage point than Coronado Island for getting a panoramic view of the beautiful San Diego skyline, replete with glistening water, marinas, and flocks of seagulls. And less than a block from the Coronado harbor you’ll find Coronado Brewing Company, which offers visitors a large brewpub setting with more than a dozen delicious house beers on tap, all of which pair very well with the casual pub-inspired menu. Bruce Glassman’s San Diego Brewery Guide, which offers essential information on each brewery, tasting notes, and touring maps, is available at www.georgianbaybooks.com. This entry was posted in Culinary and tagged coronado, mission bay and beaches, north county coastal by Bruce Glassman. Bookmark the permalink.